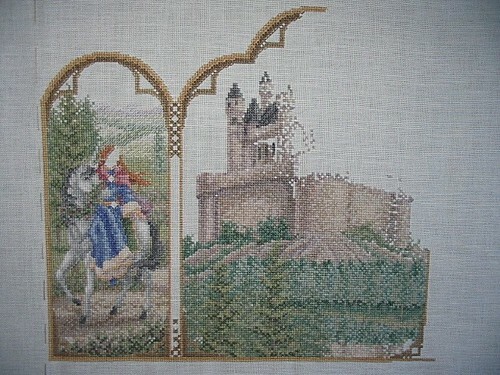 It has been a very long time since I last posted anything about my cross stitch hobby. Sadly there is very little change since that posting, as a direct result of not actually doing any stitching. Funny that. These things don’t create themselves. Anyway, as part of the settling in process here at the new house I reconstructed my floor stand and came to the decision that I really should redirect some of my energy to this lovely, creative act of meditation. So the floor stand is now set up and contains Fantasy Triptych. Now all I need to do is get my threads, needles and pattern out and ready for action. Hopefully I will be able to share an update on this work in the near future. Wish me luck. Oh, and here’s a gratuitous photograph of the work in question as last seen.